Back in August, decibelROGUE packed it’s cameras and headed to Linlithgow to cover Party at The Palace 2015. This year’s event brought together a fantastic lineup of talent from home and abroad, performing to approximately 10,000 people over two days. Second band onstage on day one was 100 Fables in what was one of their first ever gigs. If you’re a kid of the 80’s you’ll really dig these guys. Lyndsey Liora and her band’s love of 80’s post punk electro music shone through in what was a brilliant set of original compositions topped off with a fantastic interpretation of the Talking Heads classic ‘Phsycho Killer’. Since PATP, 100 Fables have continued to tour, release new material and gain radio coverage. In the last month they’ve headlined at King Tuts, supported the Bay City Rollers at a packed Barrowlands and are about to support Deacon Blue at their Hogmanay gig. Look out 2016 – 100 Fables are coming for you! 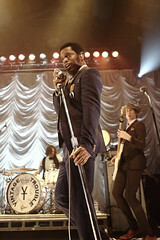 Is there a better frontman out there right now than Ty Taylor of Vintage Trouble? In decibelROGUE’s opinion, nope. Not even close. Hot on the heels of touring in support of AC/DC on their world tour, the band returned to Glasgow for the second time in 2015 for what was a tremendous show at the iconic Barrowland Ballroom. 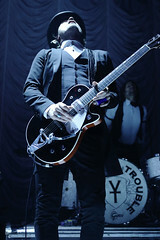 I’ll always remember my conversation with one of the security guys in the photopit before Ty and the guys came onstage. He was worried about crowd surfing. But not audience members coming over the top towards the stage, but Ty crowd surfing out into the audience from it! Crowd surfing aside, the amount of effort and energy he put into his performance was astonishing. Taylor’s often been compared to James Brown, and when you see him in the kind of form he was here, such a comparison does’t seem unreasonable. And the audience absolutely LOVED him. Brilliant voice, superb moves, brim-full of swagger and charisma. Oh, and the rest of the band ain’t too shabby either! One of the great things about running a site like decibelROGUE is occasionally you get the opportunity to cover gigs where you can watch world renowned musicians at far closer quarters than you would normally expect. So when the opportunity to cover Reeves Gabrels & His Imaginary Friends performing at one of Glasgow’s smallest music venues – The Hug and Pint – came along, I jumped at it. As someone who loves nothing better than watching rock guitarists really cut loose with massive riffs and elaborate guitar solos, this performance was right up there with anything I’ve ever seen live. But what really set it apart was Gabrels’ ability to improvise and create sounds with his guitar, which mere mortals couldn’t even conceive. Even at the end of his last song of the evening after he unplugged his guitar and placed it on it’s stand, he was still creating and manipulating sounds using the guitar lead alone. Genius! I’m gonna be talking about Chic’s wonderful performance at Party at The Palace a little later, but in the meantime I really have to doff my cap to the keeper of their groove, bassist Jerry Barnes. There’s a definite old school flavour to much of this list so far and I make no apologies for that. Because in this case, Aldridge demonstrated once again there’s no school like old school. ‘Despite’ being in his mid sixties, Aldridge put on a display of drumming which would leave drummers a third of his age gasping. Power, precision, panache, he had it all. I’ll have some of whatever Aldridge has for breakfast! Awesome. Ok, hands up, I’m a Def Leppard fanboy. And there was never any question of me not including them somewhere on this list, because having the opportunity to photograph the band who made me fall in love with rock music in the first place was a particularly big deal for me. And what an awesome show they put on! This was the largest arena that Joe Elliott and the guys had played in a long time and they seemed to enjoy the occasion as much as the packed audience. 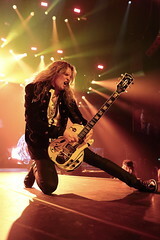 Def Leppard have made a career out of writing songs which belong in the biggest arenas and they had the huge venue rocking with a memorable collection of their biggest hits, plus songs from their recently released self-titled album. Whitfield Crane and the guys are back. Older and uglier than they used to be, but sounding better than ever! I don’t know how many years it’s been since UKJ last headlined a show in Glasgow, but the rapturous reception the band received as they took to the stage hopefully showed them that their return was more than welcome. If, before the gig, anyone in the audience was in any doubt that UKJ were going to deliver anything other than a thunderous, kick-your-face-in rock performance, from the moment they flew into first song ‘Neighbor’, there was no doubt – UKJ are back. And a hole in the sky was duly kicked! I still can’t quite believe that Nile Rodgers actually performed a gig in Linlithgow. But he definitely did – I have the photographs to prove it! So, where do you start? Well, he kicked off his set with ‘Everybody Dance’ and then roughly 2 hours and 20 legendary hits later, he wrapped things up with ‘Good Times’. In between he well and truly put the ‘Party’ in ‘Party at the Palace’. decibelROGUE has been lucky enough to cover many really good rock gigs since August, and it’s really hard to pick one that you can label as being the best. However, I’m gonna choose The Dead Daisies recent gig at The Cathouse as being the pick of them. As I mentioned earlier, it’s not often you get the opportunity to watch world renowned musicians up close and personal. At this gig, however, I was no more than three feet away from a Guns ‘n’ Roses guitarist as he launched into one blistering guitar solo after another, I was a couple of inches away from being accidentally smacked in the face by a swinging mic stand belonging to the former lead singer of Motley Crue, and at one point Whitesnake’s former bass player had one foot on the stage in front of me, the other on the crowd barrier behind me and I was in the photopit underneath him. So my head was a couple of inches away from… well… do you want me to draw you a diagram??? This was a 16 song blast of properly good hard rock, featuring many tracks from their recently released and critically acclaimed album ‘Revolución’, some earlier Dead Daisies songs, plus a few of the band’s favourite covers thrown in for good measure. It goes without saying that musically, the Dead Daisies are top notch. But what made this performance extra special was the swagger and sheer rockstar attitude they brought to the stage. They were brash, they showed off, they eyed up the ladies in the crowd, they absolutely nailed it! It takes a lot for a music photographer to put their camera down when (like here) there was no three song limit to what you could shoot. But that’s exactly what I found myself doing. They were that good. Buy their music and see them live if they roll into your town. You’ll love them too. Fantastic!